A new wall is to be built to protect a railway line that washed into the sea in 2014. Up to £80m of government funding will be made available for the project in Dawlish, Devon. The wall will be two-and-a-half metres higher than the existing five-metre tall structure to increase protection to the railway from waves during adverse weather. Network Rail spent £40m repairing the track following devastating storms five years ago. But the line, which is used by Great Western Railway and CrossCountry, has since proven susceptible to flooding, forcing services to be suspended on multiple occasions. "With up to £80m of funding available to create a rigorous set of defences, this new sea wall will help protect this vital route, building on our ambitious plans to grow this region's economy and prosperity through stronger transport connections." Plymouth Labour and Co-Operative MP Luke Pollard has welcomed news of the investment, but says he will keep campaigning for the full amount of money needed to secure long-term resilience. 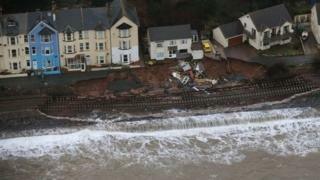 "It's taken five years to get Ministers to announce the cash for only two thirds of the upgrades we need at Dawlish. The final phase to steady the cliffs remains unfunded." The project is part of a £2bn government investment to support growth in the South West. Network Rail is continuing to use a previously-announced £15m fund to design a long-term solution to protecting the coastal area. The new plans are yet to be approved by Teignbridge District Council, which has until the end of March to make a decision.